To attend one of these workshops, please contact me and book in for a time that suits you. These are two hour sessions of intense teaching and creating, and you will leave inspired. Join artist Kelly Boler at her marina art studio for a playdate that includes one-on-one tuition and full use of an amazing variety of stencils, rubber stamps, inks, embossing powders, acrylic paint, pastels, watercolours, gel mediums, gesso, hot glue, paint daubers, watercolour pencils and crayons, die cutters, washi tape, and a huge assortment of paper ephemera. Also on hand is a library of art books filled with ideas for inspiration. 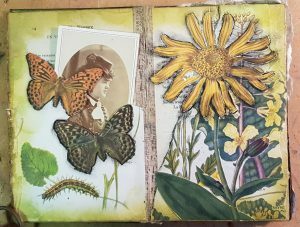 Learn how to keep an art journal, make your own tag art, try out unfamiliar art supplies and techniques, or just play. This playdate is ideal for absolute beginners as well as experienced crafters. Buy it for yourself or give to someone who might need a nudge with their creativity. Two hours includes use of all supplies, tuition on a variety of crafts, and a free starter sketchbook to work in and take home. £40 for an individual or £75 for two – bring a friend! For me this piece has a real fractured fairytale feel: Edward Gorey meets Miss Peregrine’s Home for Peculiar Children. This collage is on a vintage book cover and full of vintage paper ephemera goodness. 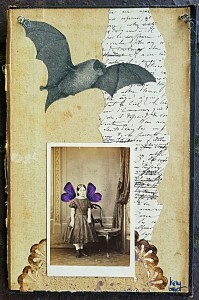 Carte de Visite of girl in pinafore and button boots, circa 1880s, with collaged wings. Fragment of handwritten, French letter, 1903. The pen and ink bat is from a 1912 Swiss zoological guide. 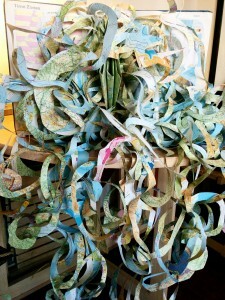 All paper ephemera is original; these are not printed reproductions! Piece measures 14 cm x 21 cm. It is wired for hanging, or the wire can be removed for framing. All of my pieces come with extra paper goodies. For the book lover or word maven in your life, or anyone who just loves old print. 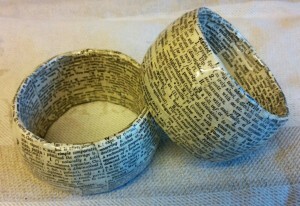 Handmade bracelet made from vintage dictionary. 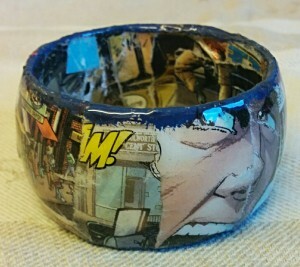 This piece is made of paper mache over bangle and finished with acrylic medium then resin for a hard, crystal-like finish. Measures 4 cm in height while diameter is 6.5 cm from inside to inside. This size should fit most. For the travel lover or dreamer in your life. 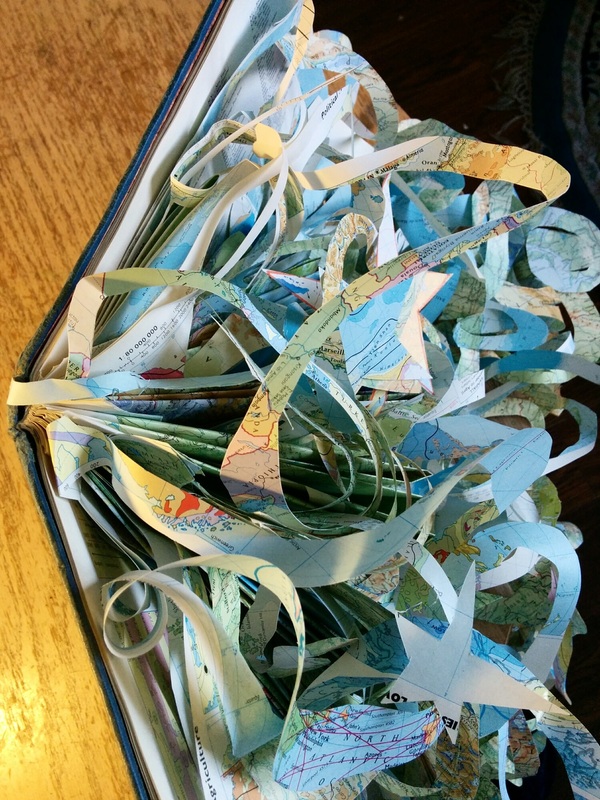 Handmade bracelet made from vintage atlas. 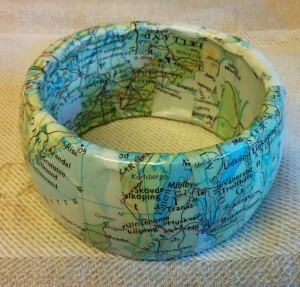 This piece is made of paper mache over bangle and finished with acrylic medium then resin for a hard, crystal-like finish. Measures 4 cm in height while diameter is 6.25 cm from inside to inside. This size should fit most. This is a first try at a book carving technique. It can be either a wall hanging or displayed on a counter. It is wild and dramatic, yet evokes all that a map should: mystery, adventure, and exploration.